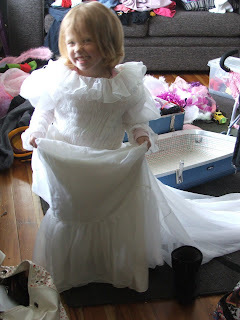 My daughter is fascinated with Weddings at the moment, and of course Princesses. Then of course we had to pull out dress and have a try on - it's too big, but nothing a little altering couldn't fix! I plan on wearing it for my 30th. I'm going to have a theme party. My dress is made in empire style, much the same as the dresses in Pride and Prejudice. Our wedding was 6 years ago, and very casual. We got married in my parents backyard, with all our friends taking photos in lieu of a photographer. It was lovely! Listening to our vows (which we wrote ourselves!) was wonderful and funny. We have changed so much but are still very much in love. I really do have my Happily Ever After - of course with all the bumps and bruises and kisses that go along with it! My daughter has a dress up wedding dress, i have no idea where my mother in law got it from - it's too short to fit her tall frame! What do you remember about your wedding? she is starting to look like to also. Yes, I sure do. We had a moonlit night. It was a full moon and the ceremony was candle lit with a harpist. I remember my husband's family kicking off their shoes and forming a line dance. 0_0 Most of them I'd met only an hour before...we had a total blast! Raquel - thats a great way to meet family! Get The Arrival At cut price! What profession do you give your heroes?